from his property, saying it was too large. July 4— It's gotten this bad. One man was so angry with his homeowners' association he burst into their meeting in Peoria, Ariz., three years ago and began firing. The gunman, Richard Glassel, had a longstanding dispute with the board. The trouble started when he refused to let groundskeepers trim his shrubs. "All of his trees, he wanted to grow like he wanted them to grow. And we went up there with an armed policeman and trimmed his bushes," one of his neighbors said. Then financial trouble led to foreclosure on Glassel's home. Intent on taking revenge on the board, he stormed a meeting with a pistol in one hand, a rifle in the other. Smokey Stover and other community residents wrestled Glassel to the ground. "Once we got the M-16 away from him, somebody said he's got another gun in his pocket and the next thing I know they're handing it to me," Stover said. Two people were shot to death, and three were injured. Glassel was convicted of the murders and sentenced to death. This Arizona case is extreme, but tensions are high in some planned communities. Fifty million Americans live in them, and while most are happy, the enforcement of association rules is turning some neighborhoods into battle zones. Some rules are picky. Frog planters were declared a violation by an Arizona homeowners' association. Pink flamingos in Georgia had to go. Some tell you that you cannot park too long in your own driveway. A California board put the kibosh on clotheslines. 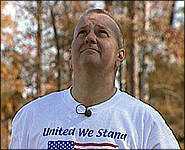 And finally, in Richmond, Va., Richard Oulton's homeowner's association demanded his flagpole come down. But he said no way. "To take it down now would be a total dishonor and an insult to everyone that has ever stood for the flag. If that flag comes down now, the next place it will fly will be over my coffin," Oulton said. He's been raising the flag ever since he was a medic in Vietnam and flew the stars and stripes over his bunker. I'm just trying to express my patriotism, my love for my country," he said. Oulton is an attorney. When he moved into the Florida community he says he checked to see if there were any restrictions on flying the flag. "There was no reference to flags or flagpoles anyplace," Oulton said. So he put up a big flagpole next to the big home he built, on three lots. His neighbors say they don't object. They say it's nice, it matches the house, and say it's an asset to the community. But the homeowner's association board said the flagpole's too big. "We had no idea someone would erect a flagpole that large when the guidelines were written," said Birdie Knuckols, former member of the association board. Since the association guidelines did not mention flagpoles — the board instead ruled it was an unapproved structure. Later they adopted rules allowing flagpoles — but only small ones, no larger than 6 feet — and required them to be attached to the house. "It's not an issue of patriotism. All we are asking Mr. Oulton to do is show his patriotism within the guidelines that everyone else in the community is willing to live by," Knuckols said. Planned communities can set these rules because they're private, and many homeowners love the rules because they like the way the regulations make their communities look nice and uniform. They say this raises property values. But sometimes the people on the boards of the homeowners' associations are very controlling. And the law is on their side So, in 1999 the board took its complaint about Oulton's flagpole to court, and won. While he appealed, he was allowed to keep the flagpole up. Oulton said, "I don't understand what the problem is. It's a property right that I have to fly this flag. It's a free speech right that I have to fly this flag." He dedicated the flagpole to the Marine unit he served with in Vietnam, a unit dubbed the walking dead because three-quarters of its members were killed. "I had a lot of guys die in my arms and once I put that plaque out there and said this flag will always fly because I owe it to my boys, my walking dead marines … I owe it to my boys," Oulton said. But it won't fly anymore. He took it down in March. All that remains is a hole in the ground, a broken plaque and mementos left by visiting veterans. Oulton lost his case in local court, and then higher courts rejected his appeals. The presiding judge told Oulton, "You agreed not to erect a structure without prior approval. That's it. No more, no less. You violated that agreement." After a four-year battle, Oulton has lost his flag, and $150,000 to the association in legal fees.